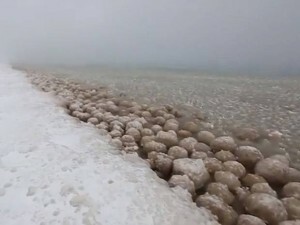 Visitors to the shores of Lake Michigan were greeted by an interesting sight this week, as waves lapped against hundreds of massive ice balls. The balls, or boulders, as some have called them, are formed when water from the lake begins to freeze and is pushed ashore by wave action, according to AccuWeather.com Meteorologist Jim Andrews. As the waves lap the shore, the ice is tumbled, smoothed and frozen into a round shape. “It’s possible that the ice is accreting like a snowball or like a hailstone, and that they keep growing,” Andrews said. While the process does require specific conditions, it’s definitely not an abnormal event, he said. A celebration by football fans in Seattle grew so loud on Monday evening it registered as a minor earthquake, a research group has said. Raucous fans jumped up and down during an early first-quarter touchdown in the game between the Seattle Seahawks and the New Orleans Saints. The Pacific Northwest Seismic Network detected the vibrations, measuring between a magnitude 1 and 2 earthquake. The Seahawks won the game at CenturyLink Field 34-7. Pacific Northwest Seismic Network director John Vidale told CNN his staff recorded five separate seismic events during the game. It was not the first time fan celebrations shook Seattle. In 2011, the response to another US football touchdown registered at nearby seismic recording stations. CenturyLink Field, which is open to the air, also set a Guinness World Record for noise in September. Will Burrard-Lucas, 30, spent five months building and learning to fly the ‘BeetleCopter’ before taking it out for a spin in the Serengeti in Tanzania. He is able to capture sweeping scenes of migrating wildebeest and antelope as well as more intimate shots of giraffe, hippo and lions. He said: “These things are much smaller and quieter than a full-blown helicopter so you can get really close to the wildlife without spooking them. Mr. Burrard-Lucas started building and testing the BeetleCopter in August 2013. The remote-controlled device is powered by six mini-rotors and capable of flying for about 15 minutes at a time. He now owns a fleet of eight BeetleCopters, capable of carrying everything from a GoPro to a full-sized DSLR camera, and is building further models for fellow wildlife photographers and videographers. Workers at an alligator conservation park in Anhui, China had the task of moving 8,000 Chinese alligators to warmer quarters last month. Conservationists were concerned the endangered alligators would not survive the cold winter in their outdoor pools, so they transferred every single reptile to indoor pools by hand. The Chinese Alligator Conservation Area of Anhui is making plans to build new pools to house the alligators. From London’s Daily Telegraph and BBC News and AccuWeather.